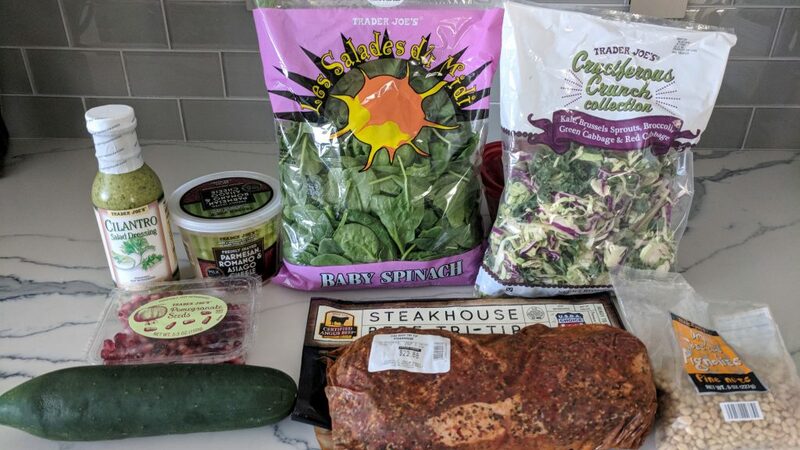 This marinated tri-tip salad is easy to make and filled with so many delicious things that you won’t want to put the fork down! The best part is that you can find all of the ingredients at Trader Joe’s! This recipe was adapted from my gym Performance 360. It is healthy and delicious and great for anyone on the go. It is super easy to make and a nice alternative to your run of the mill grilled chicken salads. 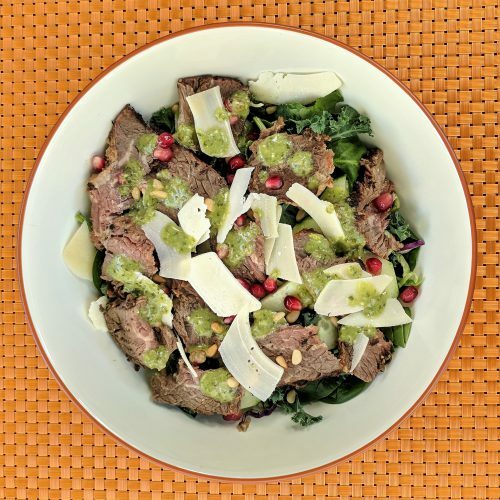 It is filled with cucumber, pomegranate seeds, pine nuts, shaved Parmesan and tri-tip! Top it with Cilantro dressing and this recipe is a winner! I LOVE pomegranate seeds! I buy them at Trader Joe’s or Costco, however the regular chain supermarket should carry them as well. If you are having trouble finding pomegranate seeds, use dried cranberries instead. I only used 1 tbsp for this recipe but I usually sneak a couple handfuls from the container while making the salad (shhhhh!). For the base of the salad, I use a blend of baby spinach and cruciferous crunch from Trader Joe’s (photo below). What really makes this recipe scrum-diddly-umptious is the Cilantro Dressing. It gives the salad such a nice flavor and even better, the brand at Trader Joe’s is low calorie. SCORE! PRO TIP: make the tri-tip in advance. 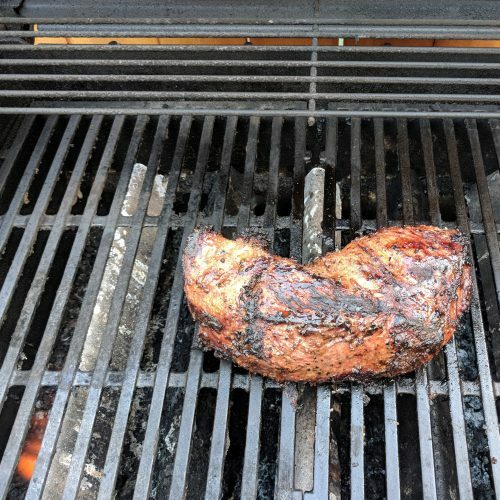 Click here for how to make marinated tri-tip. 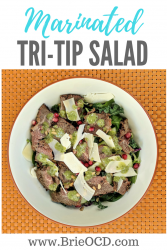 If you make the tri-tip in advance this salad takes less than 5 minutes to throw together. If I making it for my husband to bring to work, I will put the dressing in a separate container so that the salad doesn’t get soggy before he has a chance to eat it! Hope you enjoy! cook marinated tri-tip in advance. Click here for how to cook! 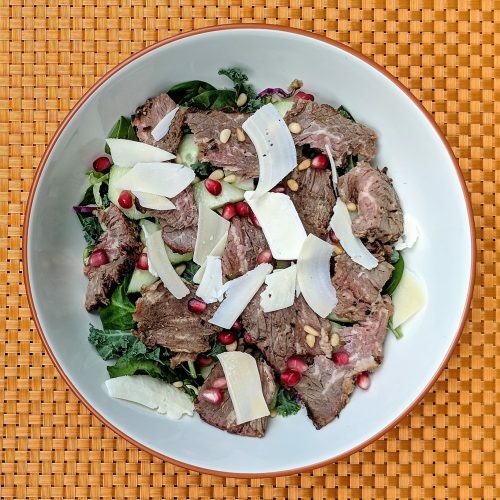 top with meat, cucumber, pomegranate seeds, pine nuts, and shaved parmesan. drizzle with cilantro dressing and shake it up! Enjoy! I ate this for lunch yesterday and excited to have it again today! It was so yummy!! Yes! so glad you liked! I only had manchego cheese rather than Parmesan and it was amazing!